The first of the famed Fabergés was Gustav Fabergé. He was the father of the more famous son, Peter Carl Fabergé, the creator of the equally famous Fabergé eggs of Russian royalty. It was Gustav, who was a German jeweler from the Baltics that started the business that he built in Saint Petersburg. Gustav opened his jewelry business in 1842 and called it House of Fabergé. They became famous for their unique decorative art form and the exquisite jewelry pieces they create. His eldest son, Peter Carl Fabergé (Karl Gustavovich Fabergé) was born in Saint Petersburg on May 30, 1846. When he was 14 years old, his family went to Dresden where his father decided to retire. Their jewelry business that was left in Russia was managed by trusted and capable managers. The younger Fabergé, Carl, continued his education in Dresden. His younger brother, Agathon, was born in Dresden in 1862. In 1864, when Peter Carl Fabergé was just 18 years old, he went on a European grand tour and received training from goldsmiths who were respected in the industry in England, France and Germany. In Paris, he entered the Schloss’s Commercial College for a course. His tour enabled him to closely view magnificent objects showcased in the galleries of top museums in Europe. After his return to Saint Petersburg and his marriage, he came under the tutelage of Hiskias Pendin, the trusted workmaster of his father. When his mentor passed away in 1882, Peter Carl began to manage their business, with Agathon joining him later. Their jewelry business also handled the restoration, repair and cataloguing of decorative objects at the Hermitage Museum from the late 1870s until the early part of the 1880s. Their business prospered and they transferred to a new and bigger location in 1881. The following year Peter Carl earned the Master Goldsmith title. His brother, who’s an exceptionally talented decorative designer, joined him. Peter Carl was a creative genius and had great creative vision as well. He was not one who relied on the beauty of precious stones and gems when it comes to overall design. He placed more emphasis on the combination of the primary materials, which will later be further enhanced by the addition of carefully selected stones and gems. It was during this time that mainstream art was also flourishing in Russia, with several painters started a separate group to escape the conservatism of the Imperial Academy of Arts. Some of them include leadings artists Ivan Kramskoy, Vasily Perov and Ilya Repin. Fame and business success followed the Fabergés. In 1882, the Pan-Russian Exhibition that was mounted in Moscow brought success to the jewelry company. Peter Carl and Agathon were awarded several prizes. With the St. Stanisias Medal and a gold medal, the brothers were highly praised by Tsar Alexander III. He had a decree made, stating that the products of the Fabergé company will be shown in the Hermitage Museum as showpieces of the finest in Russian craftsmanship. It brought recognition to the firm, with several Romanov court nobles and other people becoming their clients. Tsar Alexander III bestowed more accolades to the firm and eventually named them Goldsmith by Special Appointment of the Imperial Crown in 1885. 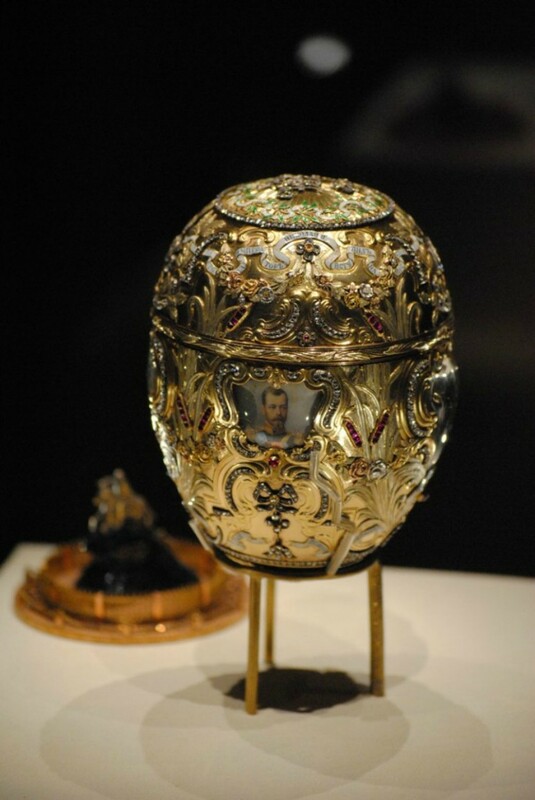 That same year, the Tsar commissioned Fabergé to do an Easter egg for his wife, Empress Maria Fedorovna, who used to be fascinated by a decorative egg owned by her aunt, Princess Vilhelmine Marie of Denmark, since she was a child. This first commission was also believed to be a commemorative gift to remember the 20th anniversary of their engagement. 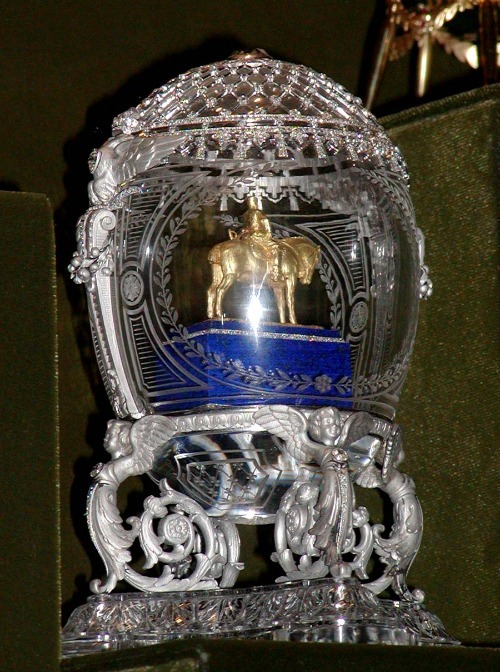 This first piece, called the Hen or Jeweled Hen egg one of the total 54 Fabergé eggs that the royal court ordered annually. The Hen looked like a real egg on the outside. Inside is a yolk of gold which can be opened. Inside it is a gold chicken, and inside the chicken was a replica of the Imperial Crown. Suspended in the crown is a small egg-shaped ruby. The Tsar was very pleased with the beautiful piece of visual art that he created the tradition of having an Easter egg created each year. Aside from the special request that each one must contain a surprise, Peter Carl Fabergé had carte blanche on the design and materials to be used. When Nicolas II succeeded his father, he continued the established tradition and ordered two eggs each year; one for the Dowager Empress and one for Empress Alexandra Fedorovna, his wife. It was only when the Bolshevik Revolution started in 1917 that the tradition ended.